Now she is asking the Elliott Advocacy team for help. Baker’s expensive lesson on how to use Venmo safely is one that anyone considering using a money transfer app should read. Although Venmo is a convenient way to send funds to friends and family, there are dangers involved. That is to say; the system is much like a wire transfer — once you hit send, your cash is gone. And retrieving it can be impossible. Baker was planning a girls’ weekend to Las Vegas for herself and her daughters. She needed two rooms for two nights. Looking for economical options, she turned to Vegas Hotel Escapes, a site that a casual acquaintance recommended. Baker says that she settled on the MGM Grand for their getaway. Copeland then told her that he would need payment in full. Baker said Copeland told her to send $1,300 directly to his personal Venmo account. Some alarm bells should have gone off for Baker at that moment. But none did. A travel agency should not request payment through a personal Venmo account. More on that shortly. Having never heard of it before, Baker did not know how to use Venmo. She asked Copeland if he could accept a credit card over the phone. She says that he told her that he preferred Venmo. So she went to the Venmo site. Acquainting herself with the general terms, she registered and connected her bank account to her newly minted Venmo account. It seemed simple enough. However the day before her trip, Baker found out everything wasn’t in order. She called the MGM reservations department directly to confirm her early check-in. And that’s when she received the startling news that she had no reservation at all. Baker contacted Copeland again via text and asked him what was going on with her prepaid reservation. Although Copeland told Baker that he would figure it out and get her reservation reinstated, Baker declined. She was about to leave for Las Vegas and didn’t want to take a chance of arriving in Sin City without a room. She wasn’t feeling confident about Copeland or Venmo now and she just wanted a refund. Copeland quickly agreed to return her $1,300 and Baker made a new reservation directly with MGM. Baker and her crew headed to Las Vegas assuming this mishap was behind her. It wasn’t. Her problem with Vegas Hotel Escapes and Copeland had only just begun. Checking Venmo. Where is that $1,300 refund? Knowing that Venmo provides an instantaneous money transfer, Baker repeatedly checked her account that day for the promised refund. When the entire day went by without any alert from Venmo, she began to get a sinking feeling. She says Copeland answered the phone and told her that he would need one week to return the money. Baker completed her trip to Las Vegas and continued to anxiously await her $1,300 refund. She waited ten days before she began hammering Copeland with texts. Copeland continued to tell Baker that he had not received the money back from the wholesaler yet. These interactions are memorialized in a plethora of texts between the two. So Baker decided to contact the wholesaler directly to find out why it hadn’t returned her money. When Baker contacted Restel, a hotel reservation center located in Spain, she got more bad news about Vegas Hotel Escapes. She asked the company why it had not returned her money. Both reservations are canceled in our system. You have to contact the agency to ask them for this refund. Vegas Hotel Scapes[sic], never paid us for these reservations, so obviously, we have not been able to refund anything. Sorry, but I can’t help you since we have not invoiced anything for these reservations. Stunned by this news, Baker realized that her $1,300 was in great jeopardy. And now she finally settled in to read all the terms and conditions of Venmo — something she should have done before using the service. Pay friends and family with a Venmo account using money you have in Venmo, or link your bank account or debit card quickly. If you’re a regular reader of our site, that last part about funding through a bank account or debit card probably is alarming. It should be. The Fair Credit Billing Act protects consumers who use their credit cards to make payments to merchants. If a merchant does not provide the goods or services as agreed upon, you’ll get your money back. Unfortunately, if you use your debit card or direct withdrawal from your bank account, you’re not protected. Baker had funded her Venmo account directly from her bank account. No credit card was involved. And so that avenue for help was already blocked. But in Baker’s case, the funding source of the payment wasn’t the only reason that this transaction had no protection. Copeland’s personal Venmo account is not an approved merchant account. The transfer was considered a peer-to-peer money transfer. Since Baker’s Venmo account was tied directly to her bank account, the funds were transferred directly from her bank to Copeland’s bank. Just like a wire transfer. And a bank cannot reverse these types of transactions once they are complete. Baker pleaded with Venmo for help. Although the representatives were sympathetic, they all pointed out that she had not used the Venmo service in the way it was intended. She had violated the terms and conditions by sending money to a stranger for goods or services. It appears that person you were transacting with did not fulfill their end of the transaction. At this point, Venmo does not allow peer to peer merchant-related transactions. We do not offer any buyer or seller protections in these types of cases. These violations of our User Agreement are very high risk and can result in problems for our users. Please remember that Venmo is a simple way for friends and people who trust each other to send money. It is not designed for uses beyond this purpose. When transacting with people whom you don’t know or trust there is always the potential for problems to arise. When Copeland had asked Baker to send the money via Venmo, it had seemed innocuous. Although she had never met him personally, she says he was friendly and seemed very interested in helping her arrange the perfect getaway with her daughters. But now his request to pay via Venmo seemed sinister to Baker. She realized she should have questioned the unusual form of payment that she didn’t understand. And the full impact of this mistake suddenly hit her full force. And that’s when she tried her last resource the Elliott Advocacy team. Why won’t Vegas Hotel Escapes send Baker her refund? When Baker sent her long, disturbing paper trail to me, she was desperate. And I also was unfamiliar with all the terms of Venmo. I hoped that there was some way to reverse this transaction. I read through all of Venmo’s conditions of use, and it soon became clear: there wasn’t. Venmo is not meant to send payment to strangers for things that a consumer wants to purchase. And sending $1,300 to a stranger for two hotel rooms in Las Vegas is not an approved Venmo use. The moment you send a payment to an active Venmo user, the funds are made available to them. There isn’t a way for us to stop the debit being made from your funding source once you’ve sent a payment to another user. And for that reason, Venmo is only intended for users to transfer money to friends and family. It is not meant to use with strangers. Baker had made many public accusations and complaints about Copeland rather early in her attempts to get her money back. We never recommend this tactic. If you’re hoping to resolve a problem with anyone, it’s essential to keep your interactions concise and pleasant. 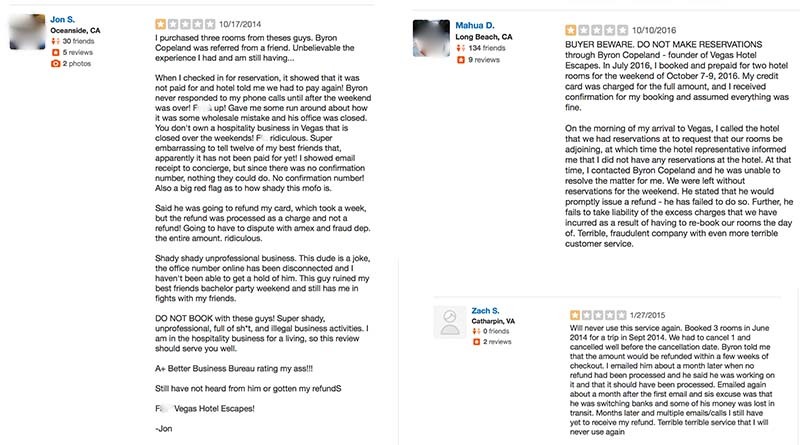 These publicly posted reviews of Copeland and Vegas Hotel Escapes on Yelp, Facebook and BBB escalated the negative feelings between Copeland and Baker. 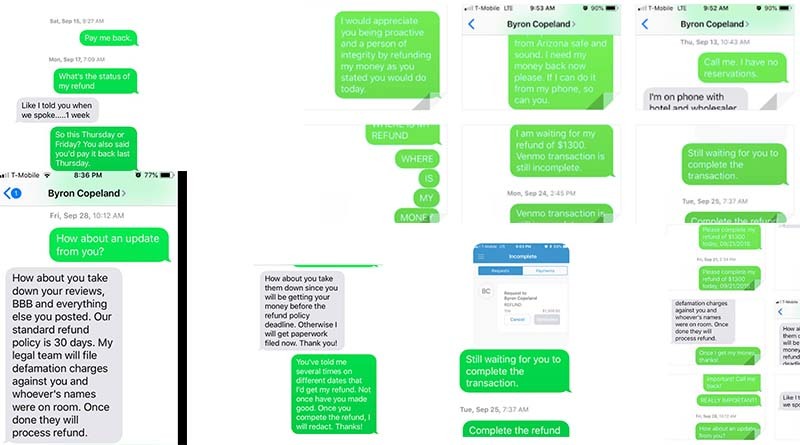 In one text Copeland warns that unless Baker takes down her accusations, she won’t receive any refund. Baker says she was never provided any information about a 30-day refund policy. It is interesting to note that there are several other similar complaints about Vegas Hotel Escapes (and Byron) on Yelp. And the agency receives an F on the BBB for failing to respond to complaints. I sent Copeland an email at Vegas Hotel Escapes. It had been six weeks since this hotel fiasco began. I asked Copeland if the refund was merely an oversight and told him that I would be writing an article about Baker’s struggle. I explained that I hoped to have a positive ending to report. He did not respond. I sent two follow-up emails to Copeland’s email address and to Vegas Hotel Escapes. Venmo is designed for payments between friends and people who know and trust one other. Users should avoid payments to people you they don’t personally know, especially if it involves a sale for goods and services (for example, concert tickets, electronic equipment, sneakers, a watch, or other merchandise). These payments are potentially high risk, and users could lose their money without getting what they paid for. We have teams dedicated to fraud prevention, support, and operations working tirelessly behind the scenes. Specifically, we use bank grade security systems and data encryption. We also use multifactor authentication when using new devices and email notifications, should passwords be changed. Unfortunately, as I suspected, Venmo can’t provide a positive resolution for Baker. And now it has been ten weeks since Copeland first promised a refund to Baker. She is busy preparing a small claims lawsuit against Copeland. He is no longer responding to Baker, and this appears to be her only possible recourse. I sent one more request for comment to Copeland this week. I warned that I would only be able to report Baker’s rendition of her experience if he did not respond. He did not. And we continue to welcome his explanation as to what happened here and why Baker’s money is still in his possession. Remember when you send money via a wire transfer or a money transfer app such as Venmo or Chase’s QuickPay, make sure you understand the service. If you don’t, you might be taking a gamble that you just can’t win. Two days after we published this article in November 2018, the chief investigator from Nevada Consumer Affairs (NCA) visited the physical location of Vegas Hotel Escapes concerning Baker’s complaint. The investigator spoke with an employee of Vegas Hotel Escapes. In the NCA report that employee is not identified by name but promised to process the refund for Baker immediately. NCA required that the payment be made through its office. One month later, when NCA had not received the payment, it sent a Final Demand notice to Vegas Hotel Escapes. As of this week, Vegas Hotel Escapes has not returned Baker’s $1,300. Although Baker has not received her money, there is a bit of good news as she sees it. Vegas Hotel Escapes is now dissolved. It is no longer licensed in Nevada and the website is dead. “At least [Copeland] won’t be doing ‘business’ as that brand anymore,” she told me last week. And NCA is continuing its investigation. In your opinion, does Venmo hold any liability here?